This is my first entry for Campus CallBack. Also other news is that I was accepted into the Design Team so I can also join the commercial contest. 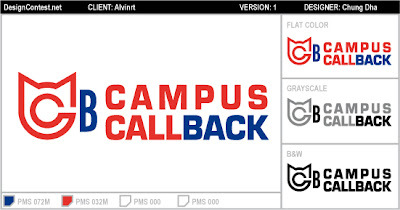 Campus CallBack is a service that will allow University students the ability to make free local and long distance phone calls from their cell phone. The contest holder wanted a cleaver/sneeky/dark edge to this logo. I made a double C in each other first then added the horns to it got a contour of a devil, bet became more too look like a single c. And used the B as a phone next to the head.